Kill your fridge. Designer Jihyun Ryou has developed a set of five contraptions that keep food fresh using natural materials, like wood, glass, rice, sand, and water. Refrigerators consume about a sixth of all household electricity, more than any single kitchen appliance. What’s an environmentally minded consumer to do? You could buy an Energy Star refrigerator, but it’d only be about 20% more efficient than a standard model. 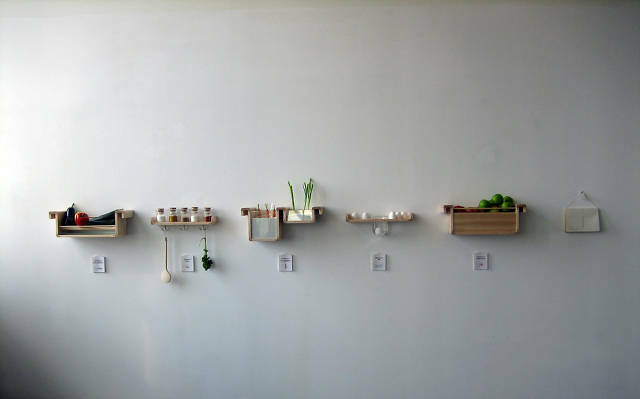 So here’s a thought: Toss your fridge, and replace it with designer Jihyun Ryou‘s manual food preservation system. Power usage: Zilch. Ethylene gas from the apples prevents neighboring potatoes from sprouting up. The conceptual system goes by the rather cumbersome name of “Shaping Traditional Oral Knowledge–Save Food From The Fridge” (can we just call it the anti-fridge? ), and it consists of five wall-mounted contraptions that use natural materials, like wood, glass, rice, and water, to keep food fresh the old-fashioned way. There’s a sand box for storing root vegetables vertically, which apparently makes them last longer. There’s a wooden fruit box that exploits the ethylene gas apples emit naturally to prevent neighboring potatoes from sprouting up all over the place. There are spice bottles with built-in rice packets that absorb humidity and keep the contents dry. Ryou even came up with a “breathing of eggs” apparatus–a fancy name for an egg shelf–that preserves eggs better than a refrigerator, he claims: “An egg has millions of holes in its shell. It absorbs the odour and substance around itself very easily. This creates a bad taste if it’s kept in the fridge with other food ingredients. This shelf provides a place for eggs outside of the fridge.” A glass of water built into the shelf lets you test the eggs’ freshness: Drop them in, and the fresher they are, the further they sink. Somebody’s been reading his Michael Pollan.